Cars park and whiz by at night and during the day at this well known attraction, the Complexe Desjardins along Rue Sainte-Catherine in the downtown area of Montreal, Quebec. At night, the lights from this complex glow as the building covers a total area of approximately four million square feet. Inside this attraction, people will find three office towers, shops, restaurants, food courts, a public plaza, banks, government services and access to an elegant hotel. 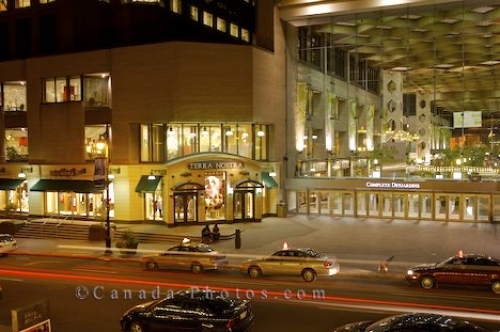 Picture of the famous attraction, the Complexe Desjardins in the downtown core of Montreal, Quebec in Canada.